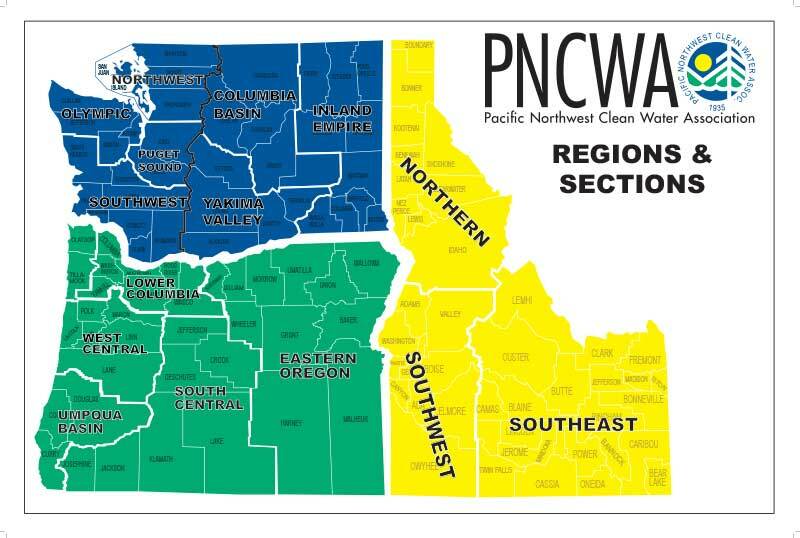 Regions within PNCWA and the PNCWA sponsored Sections within the Regions are independent organizations with their own governance, and are recognized and chartered by PNCWA. Four Regions form the link between the Sections and the PNCWA Board of Directors. The Regions are Idaho, Oregon, Eastern Washington, and Western Washington. Each Region is represented by a Regional Director who serves on the PNCWA Board of Directors. Independent local PNCWA Sections are active in each of the four regions, providing training and networking to meet the needs and interests of the area. The Sections and contact information are posted by state in the regions-Sections drop down menu. The Idaho Region consists of all PNCWA and WEF/PNCWA members in Idaho and it is also the umbrella organization the three PNCWA Sponsored Operators Sections in Idaho, Southwest, Southeast, and North. ID Region has its own Constitutions and Bylaws and each of the Sections operate under the Region Constitution but have their own unique bylaws. ► Download the ID Region Constitution and Bylaws (2009) . ► Download the Oregon Region PNCWA Constitution-Bylaws here .